Despite the introduction of free primary education in Malawi in 1994, net enrolment has remained at 78% because parents and guardians cannot afford school uniforms, writing materials and the school funds required for the maintenance of school assets. Only 58% of the population is literate, with a 64% male and a 44% female literacy rate. 11.2% of the adults over 25 years of age have completed primary school education and only 6.2% of women and 13% of men have secondary education. 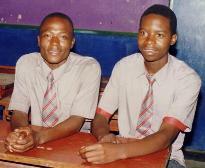 Street children are unable to attend school without uniform or support. Chimwemwe has already assisted over 20 children to return back to school. Those children have been provided with school uniforms, school funds and writing materials. For those in secondary schools, Chimwemwe has paid for text books, school fees, and school funds. 70% of them have passed their end of term exams.